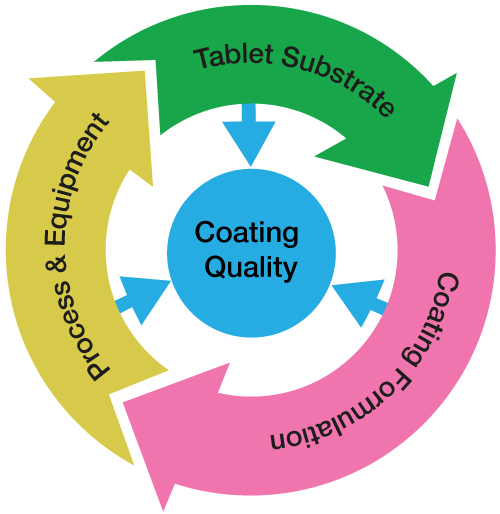 The film coating process requires a balance of the complex interactions between the tablet substrate, coating system, coating process and equipment. As with virtually everything during development, the application of film coatings may run well at the bench or lab scale – only to see challenges emerge during scale-up or technology transfer. A frequent challenge for manufacturers is scaling up to different coating equipment while maintaining reproducible coating quality. It’s common for issues not predicted earlier in development to become apparent in real-world settings. As part of technology transfer, scale-up studies involve taking the optimized, already-developed process and transferring it to various equipment types and sizes…often at other manufacturing sites. In some cases, it can involve further optimization of parameters specific to the manufacturing site or a particular piece of equipment. There are several variables, often inter-dependent, that can influence both the coating process and the quality of the final coated substrate. During scale up, you’ll need to identify all the critical process parameters. The objective is to understand the importance of each parameter to achieve your required quality and functionality at the desired scale of operation. These critical parameters need to be controlled within limits that allow the final process to be operated routinely in a manner that yields an optimal product within acceptable time & cost constraints. How do you know which process parameters are critical? You can design a DOE study to identify critical process parameters by assigning some potential factors as variables and others as experimental constants. Choosing which parameters are variables and which are constants can be complex since they are all relative. Selection must be based on well-developed process understanding and prior knowledge. 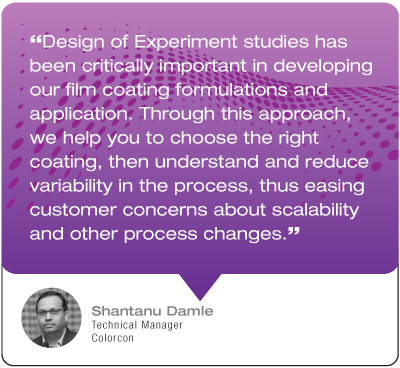 Based on studies such as the one discussed above, Colorcon has developed process parameter sheets providing the guidelines & key parameters for use of our coating products at different scales. These give manufacturers a handy reference containing relevant configuration & process parameters across different size equipment. Achieving a perfect finish for your coated tablet comes down to ensuring the right process parameters and coating formulations are used. Colorcon’s coating experts are ready to provide their expertise and knowledge to help guide you through the complexity of scale-up or transfer to new or alternative equipment or site. 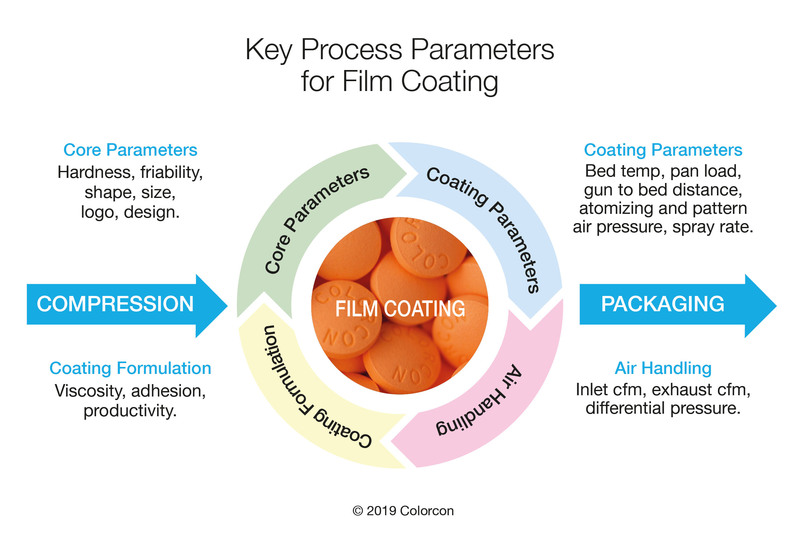 Connect with Colorcon to discuss how we can help you scale-up your coating process and simplify technology transfer. Opadry QX – a recent Colorcon technology advance – simplifies tech transfer and scale-up as it’s proven to be easy to use across a wider range of process variables. Where many coatings require narrow windows of operation, Opadry QX delivers excellent results across much wider ranges. In addition to being forgiving across variable parameters, it is effortless to work with and delivers better coating consistency with process efficiency.